Here is a list of Las Vegas hotels without resort fee, updated as of 2019. In other words, what you pay for these hotels is exactly what you pay, without any surprises. I try to keep this list up to date and already removed a few hotels that started charging resort fees. If you can see any hotels from this list that had a change of heart, please let me know! 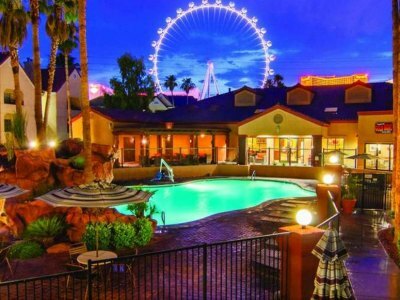 Just two blocks from the south end of the Las Vegas Strip, the Desert Rose Resort is perfect for the Las Vegas traveler that wants a bigger living situation and doesn't want to pay resort fees. This resort has one and two bedroom suites that include a separate sleeping room, a living room with a sofa sleeper, a private patio or balcony and a fully furnished kitchen for the person who likes to cook when traveling. The Desert Rose Resort also boasts free Wi-Fi internet, an outdoor pool and hot tub that is available to the guests as well as a fitness center to keep you in tune with your body. 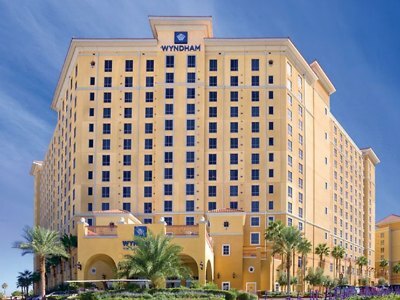 The Wyndham Grand Desert Resort is the ideal spot for the traveler that wishes to have many of the same comforts as home. The 787 suite style rooms are comprised of spacious one and two bedroom suites that include separate sleeping areas, a kitchenette, pull-out sofas with a neutral décor for your stay, whether one night or for an extended stay. The Wyndham Grand Desert Resort is a non-smoking LAs Vegas hotel without resort fees, that exhibits three swimming pools and four hot tubs for the relaxation a person needs after a hard day of work or play at the various casinos that are within walking distance or guests can take the free shuttle service to the Las Vegas Strip. The complex only has one café style restaurant and the business center is ready for whatever work may come up on your vacation. But most importantly this Las Vegas hotel does not charge any resort fees, and boasts a great location, just two blocks off the Strip, ideal for all people traveling . 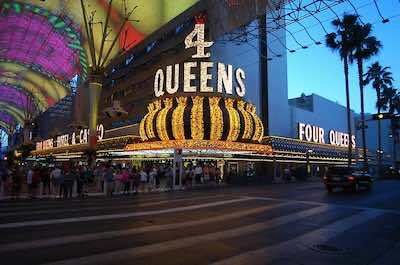 The Four Queens Hotel and Casino is a retro-style property that contains over 650 basic style rooms. The entrance to the complex is one huge neon sign reminiscent of the early 1960s in Las Vegas and is connected to the new Fremont Street Experience in old downtown. The location is perfect for the person wanting to experience the glamour life of yesteryear. You can enjoy several nearby attractions like the Mob Museum or take a shuttle or express bus to the Strip. There is also a casino and sports book parlor for your enjoyment with the Four Queens, as well as, four on-site restaurants from fine dining to a food court. Enjoy live entertainment at the on-site Mike Hammer Comedy Magic or enjoy a drink in one of the many bars located throughout the casino area. Want a perfect location without the bells and whistles? 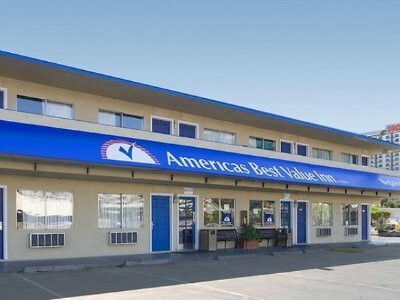 The Americas Best Value Inn is the ideal choice. Located on Tropicana Avenue this Las Vegas hotel without resort fee, and is perfect for the traveler that likes to visit several casinos on the Las Vegas Strip. The Americas Best Value Inn offers basic hotel style rooms with an outdoor swimming pool and Jacuzzi for the traveler’s enjoyment. The property does welcome pets with an additional security deposit. Parking and Wi-Fi internet are free. The Howard Johnson Tropicana is a Las Vegas hotel without any resort fees, perfect for the person wanting to stay on the go while they visit Las Vegas. The 295 basic style rooms are perfect for resting and watching television after an exciting day exploring Las Vegas. 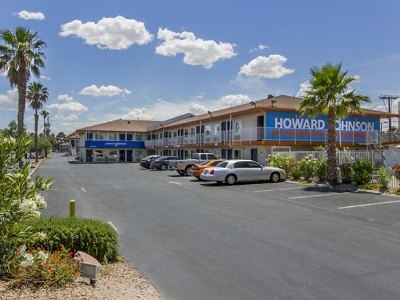 Located just a few steps from the Las Vegas Strip, the Howard Johnson Tropicana has free Wi-Fi internet and a wonderful heated outdoor swimming pool that is available year round. There is also a business center available for those last minute changes to your business plan or simply print out your boarding pass. Guests can also bring pets into their rooms for an additional fee. The Lucky Club Casino is a Las Vegas hotel that does not charge resort fees. 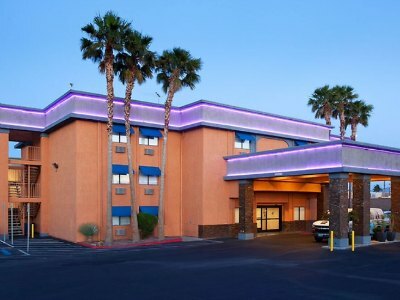 It has 95 basic style hotel rooms located some 20 minutes from the Las Vegas Motor Speedway. Each room sports southwestern décor and are available with a king or two queen size beds. 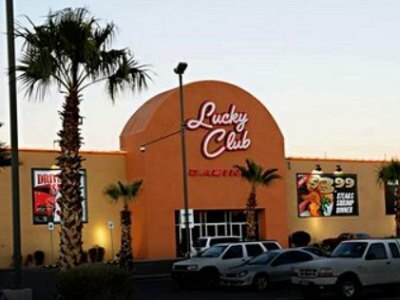 The Lucky Club offers gambling in a small but quaint casino that includes 400 slot and electronic gaming machines as well as several different gaming tables. There is also a sportsbook for all of your gambling pleasure. The Lucky club offers free parking and there is a 24-hour restaurant for all your dining needs. The outdoor pool is open seasonally and pets are welcomed to play in the on-site outdoor play area. 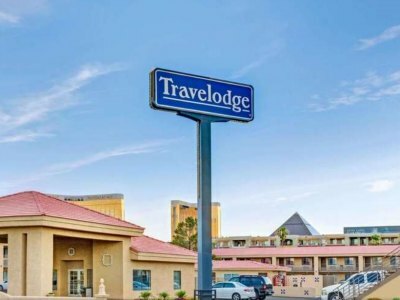 The Travelodge Center Strip Las Vegas Hotel does not charge resort fees, and has more than what the average budget style hotel offers and the location is simply superb. Located within easy walking distance to the Las Vegas Convention Center and the famed Las Vegas Strip, the complex contains 126 very comfortable rooms complete with free Wi-Fi internet and HBO. Dining and gambling options are made easy at the Travelodge Center Strip with all of the many eclectic restaurants and night clubs located on the Strip. Guests can also take a dip in the swimming pool that is open all year long. Business travelers can stay afloat on company news and projects through the business center. Guests will have a nice complimentary continental breakfast to help refurbish their body before their next adventure in Sin City. The Worldmark Las Vegas Boulevard hotel does not have resort fees, and offers its guest a beautiful and extra comfortable room to enjoy while they explore the Las Vegas Strip. There are 330 one and two bedroom suites that include a Murphy bed in the living room as well as a pull-out sofa sleeper. Each suite also has a full kitchen and private balcony or patio for you to relax and take in the memories. There are plenty of amenities which include a hot tub with a waterfall, two swimming pools and a lazy river float that can be experienced by all guests at the Worldmark Las Vegas Boulevard. For the fitness enthusiast there is an on-site fitness center with amazing work-out equipment. Guest can also take a free shuttle to various locations on the famed Las Vegas Strip. 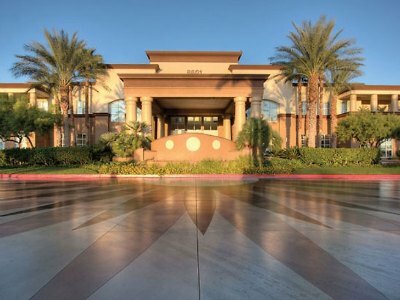 The WorldMark Las Vegas Tropicana is a very special LAs Vegas hotel without resort fees, that will allow the extended stay traveler or the family looking for a home away from home while on vacation. The complex contains 208 suites that have either one or two bedrooms for a spacious feel while you are enjoying Las Vegas or completing your business. Each suite has a separate living and sleeping area as well as a full kitchen. Suites may have the option of a Murphy Bed or a pull-out sofa sleeper. The property also boasts a state-of-the-art fitness center that includes an outdoor swimming pool and five separate hot tubs for your pleasure and relaxation. The business center is ample in size and there is also a free shuttle bus to the Las Vegas Strip. The Red Roof Inn Las Vegas does not charge resort fees, and it has 199 comfortable hotel rooms with a kitchenette that are available in either smoking or non-smoking. Situated a short walk away from the Las Vegas Strip, the Fashion Mall, UNLV, and the Hard Rock Café Hotel and Casino, this hotel offers tremendous value for the guest. 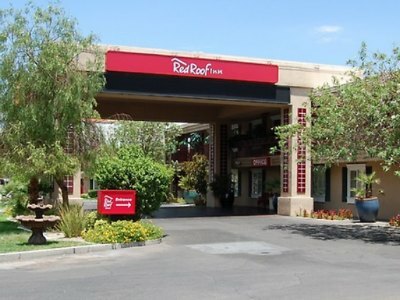 The Red Roof Inn- Las Vegas has many free amenities for their guests that include Wi-Fi internet, a hot breakfast buffet, a heated swimming pool that is open all year, a fitness center and free coffee. Pets are also welcomed for an additional fee. 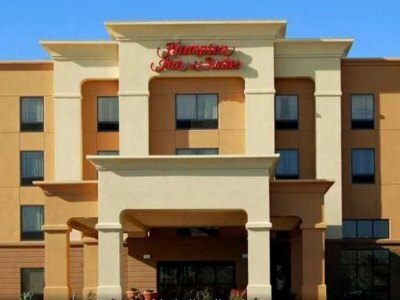 The Hampton Inn and Suites- Las Vegas South is an ideal choice for the business traveler or the vacationer that wants to be away from the action. This property offers several styles of rooms ranging from a standard king size with a refrigerator and microwave, to a suite that includes a separate living area. The Hampton Inn and Suites- Las Vegas South has a complimentary hot breakfast which a guest can enjoy while reading a free copy of the daily USA newspaper or checking email with the free Wi-Fi internet connection. There is also a 24-hour fitness and business center to help with the last minute details of work. There is also a convenience store, an outdoor pool and hot tub area. Pets less than 40 pounds are permitted for an additional charge. 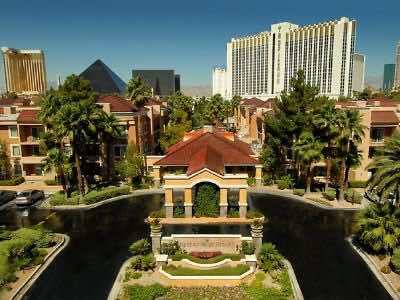 When your family is looking for an upscale Las Vegas hotel with no resort fee which is close to the Strip and offers lots of onsite activities, then the Holiday Inn Club Vacations at Desert Club Resort is superb. Located 1-block from the Strip, the Holiday Inn Club Vacations at Desert Club Resort boasts modern three story buildings with 658 all-suite units which are furnished with a contemporary decor. Suites range from one to two-bedrooms from 515 to 1,030 square feet in size and are furnished with a separate living room and sofa sleeper, full kitchen, fireplace and a washer/dryer. There are five freshwater swimming pools, a game center for children, putting green, fitness center and BBQ grills. Complimentary items that add value include children activities, Wi-Fi as well as free shuttle service to the Strip and Fremont Street. Dining onsite includes the Gold Mine Bar and Grill which serves all three meals. This is an ideal location for the person with a quick layover. 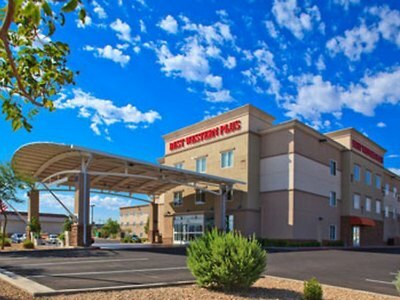 Located minutes from McCarran Airport and the Las Vegas Strip, the Best Western McCarran Inn does not charge resort fees and has over 100 rooms that offer basic amenities as well as deluxe suites outfitted with a kitchenette and sofa bed. This property boasts many complimentary services such as a buffet breakfast as well as shuttle service to/from McCarran Airport and the Las Vegas Strip. The guests at Best Western McCarran will benefit from a complete business center and free Wi-Fi internet. Unwind at the end of the day in the heated pool or the Jacuzzi. The Best Western Plus Henderson is the perfect Vegas hotel without resort fees for the traveler to Henderson, Nevada. 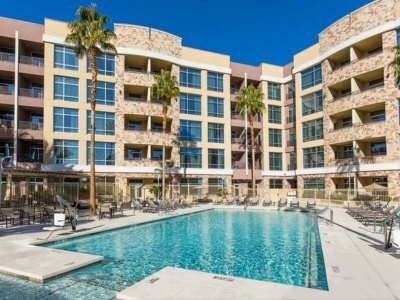 Situated near Sam Boyd Stadium and with easy highway access to Hoover Dam and Lake Mead this property has 115 king size bed or two queen size beds standard rooms that include a microwave and a refrigerator. The property has a swimming pool open year round and a 24-hour fitness center that has all the exercise equipment you need to stay fit. There is also free Wi-Fi internet and an on-site bar for you to enjoy your favorite libation. The Royal Vacation Suites offer the business and tourist guest all the comforts of home. Located a short distance from the Las Vegas Strip, the Las Vegas Monorail and the Convention Center, this Las Vegas hotel doesn't currently have any resort fees. It offers studio rooms complete with a king size bed, a murphy bed and a small kitchenette. The larger suites have a separate living room complete with a pull-out couch. Royal Vacation Suites are perfect for relaxing near the waterfall in the outdoor swimming pool and Jacuzzi as well as toning your body in the fitness center. For those last minute work needs the on-site business center is helpful. The lobby is charming and displays a baby grand piano as well as a small bar so you can enjoy your favorite cocktail. Satisfy your gourmet pleasures in the on-site restaurant serves dinner nightly. The Travelodge Las Vegas Airport is a prime choice for a person looking for easy walking access to the Las Vegas Strip and a free shuttle bus to/from the McCarran Airport. 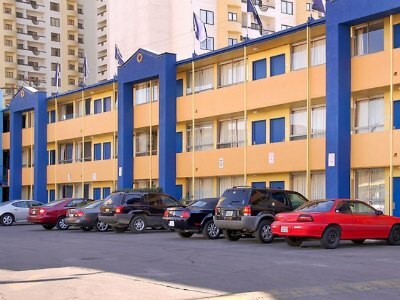 This budget style hotel offers comfort and location that is perfect. Guests can devour a complimentary continental breakfast, print out their bordering pass or simply relax and surf the net with free Wi-Fi internet. 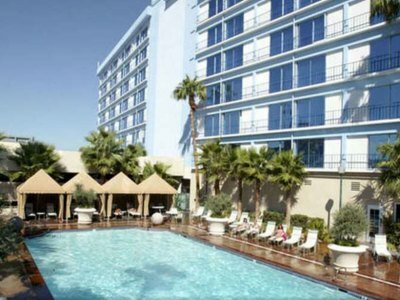 At the Travelodge Las Vegas Airport patrons can also enjoy the large outdoor swimming pool to cool off from the heat. 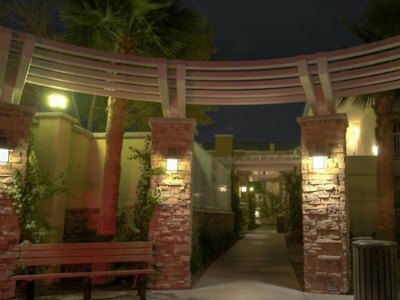 This is the ideal location for a person wanting to be close the Strip, UNLV, McCarran Airport and many museums. 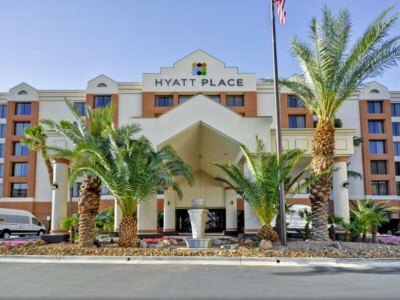 Looking for a quieter Las Vegas hotel that offers plenty of amenities, value and is great for families, then the Hyatt Place Las Vegas is perfect. Located less than a mile away from the Strip on Paradise Road, this no resort fee Las Vegas hotel is packed with freebies. Situated on six floors, the hotel has 202 one-bedroom suites that offer 355 square feet and a separate living area with a sofa sleeper. Onsite you will find numerous amenities such as an outdoor freshwater swimming pool and a 24/7 fitness center. Complimentary items that add value include free Wi-Fi, complementary shuttles to and from the airport as well as the Strip and you can start your day with a free breakfast. There is also a 24/7 Gallery menu available for food and beverage service throughout the day and night. One of the best Las Vegas hotels without resort fee that offers plenty of complimentary amenities that will add value to your stay is the Staybridge Suites Las Vegas. Located one-half mile away from the Strip on Dean Martin Drive, the Staybridge Suites Las Vegas boasts a five floor building that houses 118 all-suites which feature a recently renovated contemporary interior. Suites range from studios to one-bedrooms with a separate living room. All suites have a kitchen or small kitchenette (microwave and refrigerator), sofa sleeper, choice of bedding, floor to ceiling windows and a private balcony with various views. The hotel boasts a freshwater swimming pool with complimentary cabanas, a fitness center, Wi-Fi, free airport shuttle as well as a free shuttle to New York New York on the Strip. Other freebies include a complimentary breakfast and an evening reception on selected nights of the week which features complimentary appetizers as well as libations.